We have been encouraging my youngest to learn to ride his bike without training wheels since last summer. We even bought him a new bike that fits him better but isn’t designed to attach training wheels. As an active family, this is somewhat self serving and as the one who has to pedal for both of us on the tandem bike setup, it is very selfish of me. Thus the investment. In talking about riding he has revealed that his fear is around falling. He is worried about getting hurt and as such, most of his attempts to ride are hampered by his fear and reaction to any unsteadiness (which leads to more unsteadiness and so on, you get the point). So he suggested that if he had pads that he would feel more comfortable and safe to try to ride. It was our “AHA” moment. Although we haven’t yet been out to ride for real (he has spent quite a bit of time with his bike hooked up to one of our indoor trainers, where he can pedal and not fall over), we are optimistic. 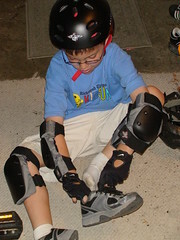 The trip to the sporting goods store set him up with a new helmet (skateboard style), elbow pads, knee pads and gloves (for good measure). The idea is to make him fee safe and to make sure if he does fall, he will learn that it is no big deal, you just get back up and try again. This approach can be applied to many things in training our kids. If they object to something, find out why, what are the real underlying reasons? Then address that. Make them feel comfortable and safe. Setup an environment where they can experiment without getting hurt. If they can try and fail then try again, it teaches persistence and alleviates fears of the unknown in new areas. Now I am not sure how this applies to things like trying new foods or trying to do their homework earlier but I am sure there is a stretch that will work for that too. Perhaps something silly like wearing a helmet to dinner (not when eating out) as symbolism to protect them from carrots!!! Whatever it takes, finding out what they are worried about and what is limiting them will hopefully reveal a path to address it , adapt and overcome. Providing a realm of comfort will open up opportunities to try new things, and allow them to grow in new areas of their life, developing into a well rounded person you know they can be.